Welcome to Blog Profiles! Each week, PR Newswire selects an industry or subject and a handful of sites that do a good job promoting, contributing, and blogging about it. Do you have a blog that deserves recognition? Tell PR Newswire audience relations manager Christine Cube why on PR Newswire for Bloggers. I get a great many blog submissions through the contact form on the PR Newswire for Bloggers site. 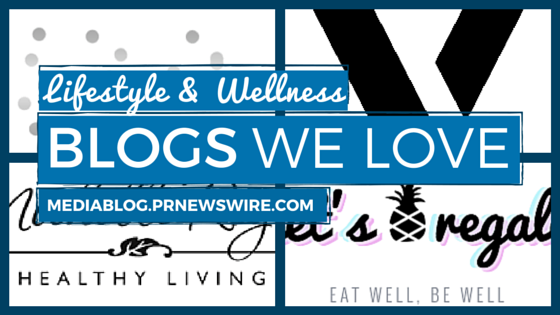 Among the most popular submissions – lifestyle and wellness blogs. So that’s who we’re highlighting this week. TheVogueVibes is a Manchester-based lifestyle site whose audience is 18- to 35-year-old adults. They are nice. They also have some pretty great content. A few awesome posts that stood out to me include Music/Style Icon: Diana Ross, Las Vegas’ 5 Best Casinos, and How to Dress With Style When a Motorcycle is Your Main Form of Transport. Michelle Rogers Healthy Living aptly describes Rogers’ journey from weight loss to healthy living. Rogers covers health, beauty, recipes, reviews, and celeb news. Let’s Regale is the healthy living blog of San Francisco native Valerie. Cooking is a huge passion of Valerie. And she does travel. Notable posts include Where to Experience the Best Coffee Culture in Barcelona, #Bewell: 5 Ways to Workout Without the Pain, and The Healing Cuisine: Cooking with Intention. 30s and Chic is the personal lifestyle blog of 30-something Chicago professional Nikki Kanter. Kanter admits she doesn’t feel like her life didn’t really come together until she approached her late 20s/early into her 30s. Interesting posts include My Holiday Gift Picks for Your Dog, How I Am Avoiding Holiday Weight Gain, and Our Home, Part 1. P.S. Ever wonder how we come up with ideas for our blog profiles? Our handy list of industries and subjects on PR Newswire for Journalists stays top of mind. If you’re a blogger or journalist looking for health and wellness news, let us know. We can customize a newsfeed for you on PR Newswire for Journalists. Christine Cube is an audience relations manager with PR Newswire and freelance writer. She’s trying to still decide on a New Year’s Resolution. It’ll come to her eventually. In the meantime, happy holidays! Follow @cpcube or check out her latest on Beyond Bylines on PR Newswire for Journalists.